The requirement to have an annual MOT test for pre-war cars may be scrapped following a meeting between Transport Minister Mike Penning and members of the All Party Parliamentary Historic Vehicles Group, of which Lord Montagu of Beaulieu is President. The meeting took place on 20th January at the Palace of Westminster between Lord Montagu, Conservative MP for East Yorkshire Greg Knight, who is the Parliamentary group chairman and Transport Minister Mike Penning. Mr Knight added: “Accidents involving historic vehicles are extremely rare and the majority of owners are meticulous in keeping their vehicles in good condition. Having to have an annual MOT test for a vehicle which may only travel 100 miles in a year is an unnecessary bureaucratic hurdle”. Minister Mike Penning said, “The MOT is important in helping to ensure that cars are safe for use on our roads. However, we need to be sure that the regulations we impose are having their intended effect. That is why I am going to look at whether there is a case for exempting older historic and classic vehicles from the MOT test. These vehicles are treasured by their owners who want to ensure they are well maintained, and in most cases they use them irregularly. I have asked my officials to look at the evidence on this issue and we will carry out a full consultation to allow interested groups to submit views”. 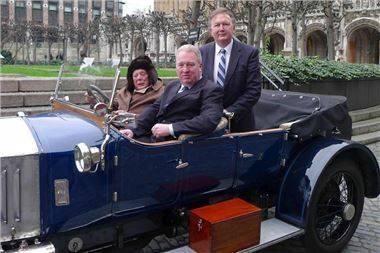 Pictured after the meeting, leaving the Palace of Westminster in Lord Montagu’s 1914 Rolls Royce Alpine Eagle from the National Motor Museum collection, are Lord Montagu of Beaulieu (front driving), Minister Mike Penning MP (front passenger), Rt Hon Greg Knight MP (rear).